Portable racks are probably the most underutilized storage devices. Part of the reason for their underutilization is that they come in many styles and are referenced by many names. Stack racks, nestable racks, and bar racks are a few of the names. The family name ‘portable rack’ is used because the rack structure is made to be liftable by a lift truck, just like one would lift a pallet. In some occasions portable racks will have casters for mobility. 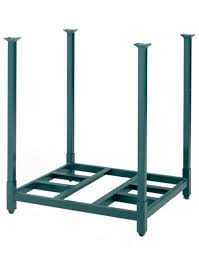 Portable racks can eliminate or significantly reduce the need for pallets. Portable racks can be manufactured in many different sizes and many different shapes for specific purposes. Portable racks can then be configured for use for unlimited applications. They can be configured for selectivity like selective rack. They can be configured like drive-in rack or drive-thru rack. Portable racks can be configured for any process, density, selectivity, or layout the user desires and can be easily reconfigured for future needs. CSI is your logical choice, if you are looking for Portable Racks in the Chicago, Illinois, or Mid-West states areas. We have access to a lot of different manufacturer's portable rack product. We highly recommend EGA Products and SPG as exceptional portable rack manufacturers. Portable racks are a very feasible and economical tool for small and mid-size operations that typically have highly fluid storage and staging demands. IF YOU DO NOT SEE SPECIFICALLY WHAT YOU ARE LOOKING FOR, Contact us. We offer a wide variety of options, including post heights, bases, custom designs, designs for specific product, and more. If it is determined that portable rack will not assist in achieving your objective we have many forms of pallet storage for many different objectives and environments: Selective Racks, Pushback Racks, Cantilever Racks, and more.